Boston, Museum of Fine Arts (12): 6, 8, 15, 17, 28, 29, 41, 42, 44, 50, 53, 67. Malibu, J. Paul Getty Museum (44): 2, 4, 5, 7, 10, 11, 12, 13, 18, 19, 20, 22, 23, 24, 25, 26, 27, 30, 31, 32, 34, 36, 37, 39, 40, 43, 45, 46, 47, 48, 49, 52, 54, 55, 56, 57, 58, 59, 61, 62, 63, 65, 66, 68. New York, Metropolitan Museum of Art (5): 3, 9 [Sarpedon krater still in New York on loan], 14, 16, 51. Princeton, University Art Museums (1): 1. The Royal Athena Galleries, New York (5): 21, 33, 35, 38, 64. It is striking that 15 pieces were represented by South Italian pottery: Apulian (11), Lucanian (2) and Paestan (2). Seven bronzes and pots are Etruscan in style. Twenty-eight of the objects are Attic pots, both black-figured (5) and red-figured (23). 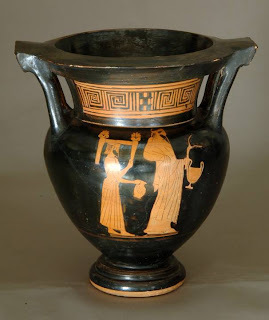 Such pots are regularly found in Etruscan tombs as well as the cemeteries of the western Greek colonies. Attic red-figured column-krater showing Dionysos (no. 20). Attributed to the Geras painter. From the Royal Athena Galleries, New York. Update: One of the pieces (no. 10) reported to be from the Metropolitan Museum of Art was mis-catalogued and is correctly placed here as ex-J. Paul Getty Museum.